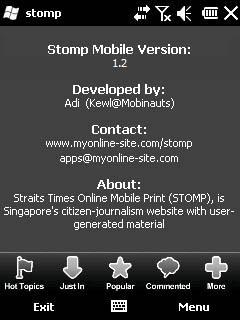 Developed for the WM 6.5 platform, Stomp Mobile, is the unofficial Windows Mobile 6.5 application that lets you read local Singapore news from the Straits Times Online Mobile Print (STOMP) website. Being Singapore’s citizen-journalism website with user generated material, new contents are constantly posted so you will never get bored again. Specially designed for the small screen of your mobile phones, the Stomp Mobile apps brings to you articles and news from various categories. Browse through the uploaded pictures with ease, or read all the comments posted. A must have app, which keeps you updated on what’s going on around Singapore.